The Youth Department of the Autonomous Government of Catalonia organises international summer workcamps in the region. Basically these workcamps consist of different projects where young people participate doing voluntary work as services to the local community, helping people, nature protection or practical work on historical heritage among others. In the framework of the 2014 workcamp, our proposal was to focus work on one of the aspects of the Iberian culture that has been more investigated lately: the production of wine. It must be clarified that it was not intended to make a proper experiment out of this activity, as it was not our aim to undertake comprehensive and accurate monitoring of the results and therefore it is complicated to draw many conclusions because there are many variables that have not been considered, for instance the grape variety. The workcamps in Calafell are coordinated by the Fundació Pere Tarrés, a non-profit organisation of social action devoted to the promotion of leisure education and volunteering among other objectives, and the municipality of Calafell is one of the organisations that support these workcamps. So far La Ciutadella Ibèrica has held three of these projects (2010, 2012 and 2013) with international volunteers being the core theme of the activity. 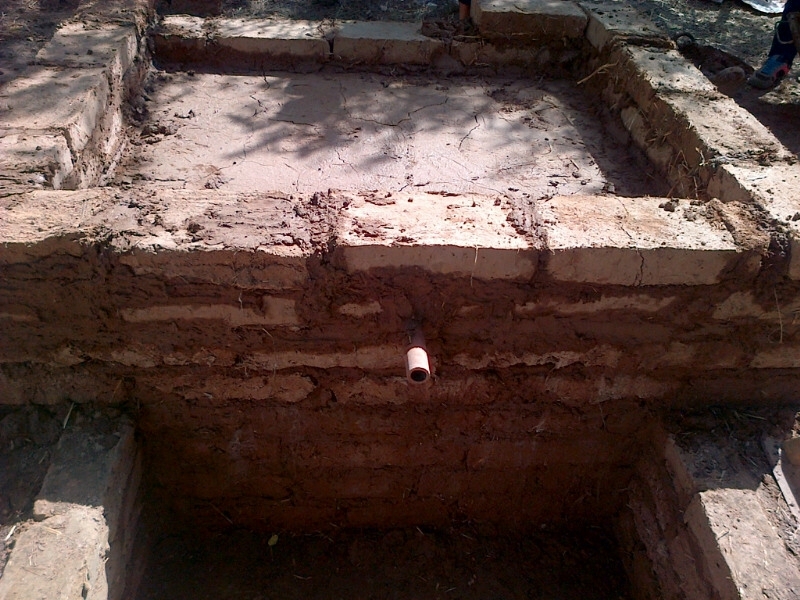 Participants learnt about construction techniques in the Iberian times and they made an important contribution to the reconstruction of some parts of the archaeological site. In 2014, the Iberian Citadel also held a summer workcamp, this time from 18 to 30 August with 24 young people aged 18-29 coming from different countries around the world (Armenia, Taiwan, Czech Republic, Russia, Japan, France, Poland, Greece for example). In the framework of the 2014 workcamp, our proposal was to focus work on one of the aspects of the Iberian culture that has been more investigated lately: the production of wine. Based on studies made in different Iberian archaeological sites it has been possible to reconstruct the process of making wine, a drink that was introduced in the diet of the settlers of El Penedès area (See Figure 1) since the seventh century BC, according to several evidences found1. 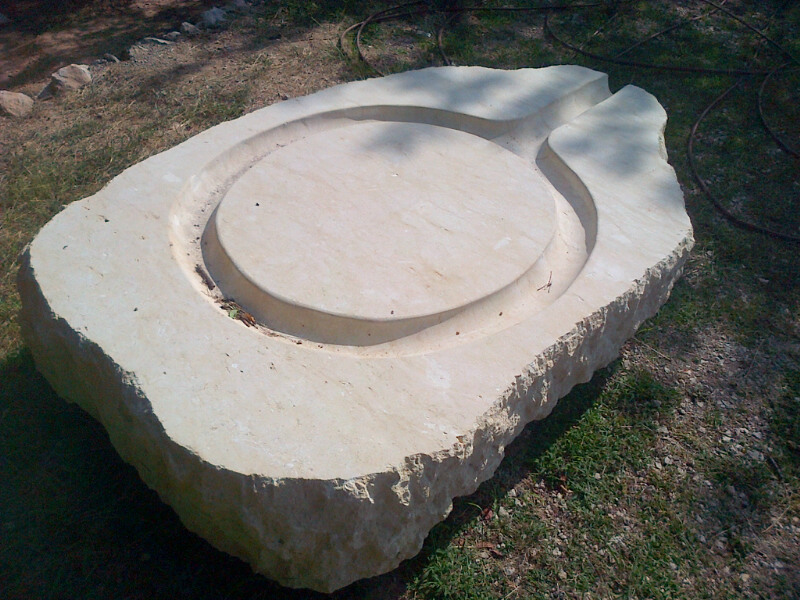 Just to mention the more significant evidences, we will refer to discoveries at two archaeological sites. Firstly, Turó de la Font de la Canya in Avinyonet del Penedès, with a huge field of silos where evidence of grape seeds was found and dated to the seventh century BC. 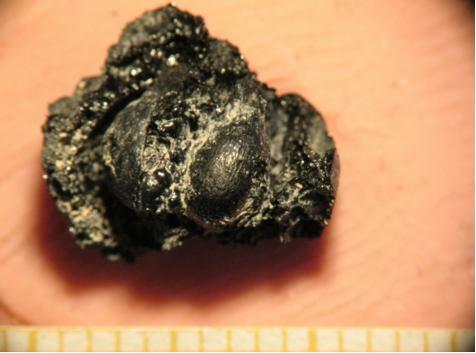 Secondly, La Ciutadella Ibèrica of Calafell, where alongside the discovery of carbonised grape seeds found, a full grape in carbonised state stands out, dating back from the third century BC (See Figure 2). Despite these findings, no structures used for winemaking have been found in any Iberian site in El Penedès area. However, these facilities have been documented in other Iberian sites of the same chronologies. What we intended with this proposal was to make a replica in the experimental area of La Ciutadella Ibèrica of the facilities identified as wine production centres of two Iberian sites excavated in El Campello (Alicante, Valencia Region) and Verdú (Catalonia). At the Illeta dels Banyets site in El Campello, it was identified a place where grapes were trampled to make wine later on. The other one is the Iberian village of Estinclells in Verdú, where the base of a press was excavated in a room where remains of grape seeds have been recovered. In this case, next to the site, a programme of experimental archaeology was developed by the Center of Lacetan Studies in order to ascertain the press function. Chronology is from 3rd century BC in both cases therefore it coincides with the phase of reconstruction of La Ciutadella Ibèrica. La Ciutadella Ibèrica ordered a sandstone replica of the press base documented at Estinclells site from a local stonecutter. Participants were divided in three working groups, one for producing clay bricks and the other two to build two open-air production structures - the trampling platform and the press area - with the help of Ciutadella Ibèrica staff who were monitoring the activity. This process took about four mornings and once the structures were built, they were left drying during three more days (See Figures 4 & 5). One rainy morning we took the opportunity to organise a guided visit to the VINSEUM, the museum of the wine cultures in Catalonia, located in Vilafranca del Penedès, in order participants could widen their knowledge on the cultural and economic relevance of the wine world in the region. 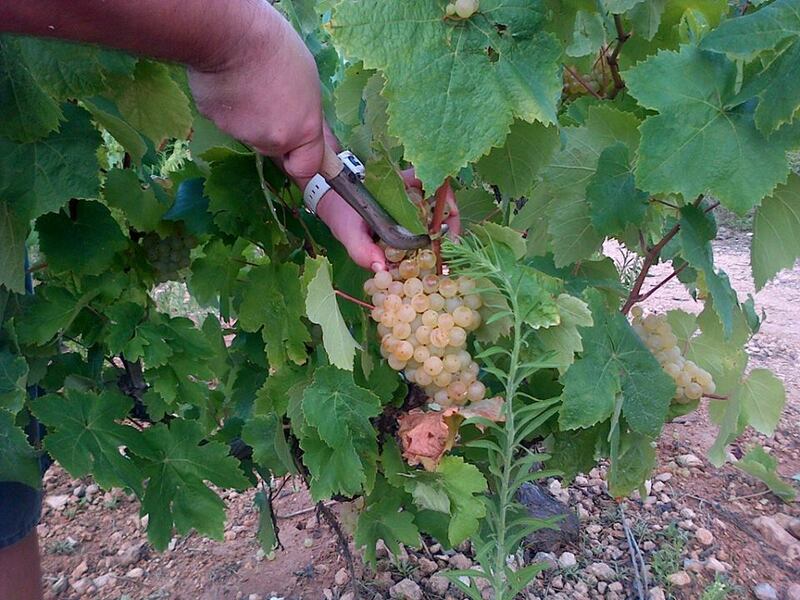 On the second week, the young volunteers went to a vineyard in Calafell with the aim to pick grape clusters using pruning shears but also they could use replicas of pruning hooks (See Figure 6) as documented in the excavations of La Ciutadella Ibèrica. Grape clusters were put into baskets and taken to La Ciutadella Ibèrica by farm tractor. Almost 1500 kg of grape was collected as a result of the harvest. 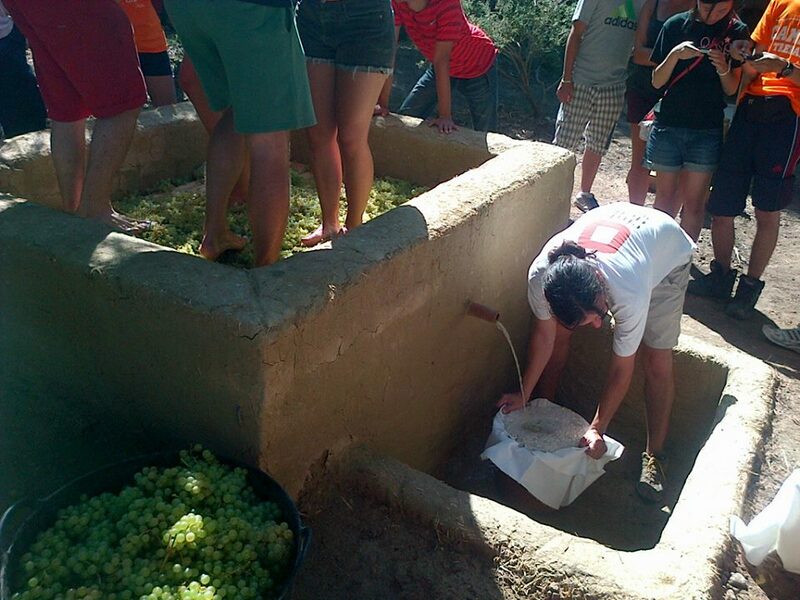 Participants spread the grape clusters on the platform and in groups of four they crushed grapes barefoot. This part worked quite well, the grape juice obtained was abundant and it was collected in ceramic replicas, kalathoi type, with a piece of cloth in the top in order to strain grape skin and other solid elements (See Figure 7). 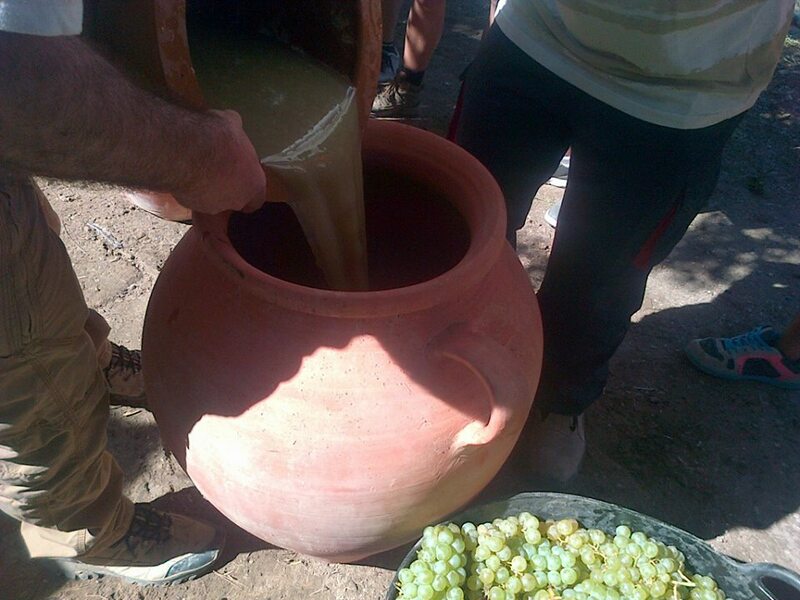 Everyfilled kalathos had around 15 litres of grape juice that was transferred later into replicas of Iberian amphorae that were produced in another experimental archaeology project that took place in Verdú, coordinated by the Centre of Lacetan Studies, the University of Lleida and re-enactment group Ibercalafell, with the involvement of La Ciutadella Ibèrica in the latest phase. Some of these resultant recipients were used then for storage of the grape juice to be fermented. To make the most of them in the pressing process the rest of the crushed grape clusters that were on the platform were put into esparto baskets*, This obtained more juice by applying weight in a wooden beam that pressed the baskets* with the rest of the clusters in them. The resultant juice dropped on the sandstone base, flowing down to another ceramic recipient of a large volume, pithoi type (See Figure 8). This process of trampling-pressing-storing was repeated for about 3 days and we obtained about 1000 litres of grape juice as a result. 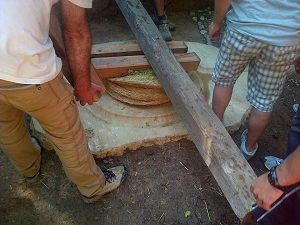 Before ending the workcamp, the participants and staff transferred all the grape juice into large jars and amphorae for storage (See Figure 9): one part inside the North tower of the reconstructed wall of the village and the other one, three pithoi type vessels that were left outdoors in the experimental area of the site, following grosso modosome of the suggestions recorded by Hesiod in Works And Days about vintage timing2. Finally, 200 litres of grape juice were added to a wooden barrel in order to experiment another fermentation system not documented in Iberian times but used already in Roman times. At this point, after ten days, the tasks of the workcamp participants ended. However, the staff of La Ciutadella Ibèrica continued the experience in order to know if we had indeed succeeded to make ‘drinkable’ wine after the fermentation process. By mid-October we took some samples (as much from the trampled grape as from the pressed) from the jars and amphorae stored and we could check that we had made wine, very strong but ‘drinkable’ after all. During wintertime, following Classical sources, some additives were added to the wine. Nevertheless we decided to focus on vegetal additives only, specifically mugwort, myrtle and wormwood and we decided not to add other types such as mineral or animal additives. Three samples with additives were kept in airtight glass bottles. In January 2015 a range of samples were taken to an enological laboratory to determine very specific values such as the ABV (Alcohol By Volume) or the acetic acid level3. The results of the analysis conclude that those three bottled samples that were airtight did lose less ABV (between 6.0-7.5%)4 and kept values of 5.7-10.1 degrees of acetic acid per litre, therefore, we could affirm these samples did not turn into vinegar. The other samples exceeded 20 degrees per litre and even one of them, sample number 9, far exceeded the scale, with 38.1 degrees per litre. Pure vinegar. Regarding the main objective of the activity - that is, to recreate the facilities based on archaeological evidences with the workcamp participants and the staff of La Ciutadella Ibèrica as a hands-on experience to test and learn about the winemaking methodology in Iberian times - we can say the result was quite satisfactory as indeed, in about ten mornings of work, with a daily team of 15-20 people, we were able to build the structures, harvest the grapes and complete the production process including grape-trampling, pressing and storage. On the other hand, regarding the later phase, it must be clarified that it was not intended to make a proper experiment out of this activity, as it was not our aim to undertake comprehensive and accurate monitoring of the results and therefore it is complicated to draw many conclusions because there are many variables that have not been considered, for instance the grape variety. Nevertheless, despite the lack of a constant monitoring, the obtained results have allowed us to draw some interesting data in order to consider to developing a proper experimental action on the subject in the future. It should be emphasised the importance of hermetically sealing the ceramic receptacles in the storage process. As it was pointed out before, only those samples that were bottled airtight could provide a satisfactory result in the time it was stored. It would also have been interesting to have made intermediate analysis in order to determine how the wine was changing over time to measure differences between the outdoor wine and the one kept inside. Only one laboratory analysis was made with most of the samples taken many weeks after fermentation. The estimated final results were that we obtained almost 1000 litres out of 1500 kg of grape cluster picked and processed in the structures. From the over 900 litres obtained, about 100 litres are from the pressing process, so we can say thatthe pressing system allowed to obtain 12% more than just use of the trampling system. It must be said though that there is a noteworthy amount of clay coming from the press process that will be settled in the receptacle afterwards. This is because it was decided to use clay for the press canalisations instead of lime mortar, for safety reasons. All in all, we think this has been a very enriching learning experience for the volunteers and the general public who visited the activity spot during those days, as it allowed to test and gain some more knowledge on the methodology the Iberians used to make wine. Also it was great for the educational team of La Ciutadella Ibèrica because despite there being no constant monitoring for this activity after the workcamp (not the main objective) we can conclude that if specific measures had been applied after the storage process (especially the airtight sealing of the recipients after the fermentation) we could have produced a consumable wine. Perhaps we have the base here for a more comprehensive approach in the future. The word ‘basket’ is a close approximation to the Catalan word ‘cofi’ which has no literal English translation. Shown in the Figure 8 beneath the beam. ALONSO, N.(1992): Conreus i agricultura a la plana occidental catalana en època ibèrica. Estudi arqueobotànic de Margalef (Torregrossa, el Pla d’Urgell) i Tossal de les Tenalles (Sidamon, el Pla d’Urgell). Quaderns d’Arqueologia del Grup de Recerques de “La Femosa”, Artesa de Lleida. ALONSO, N. (1999): De la llavor a la farina. 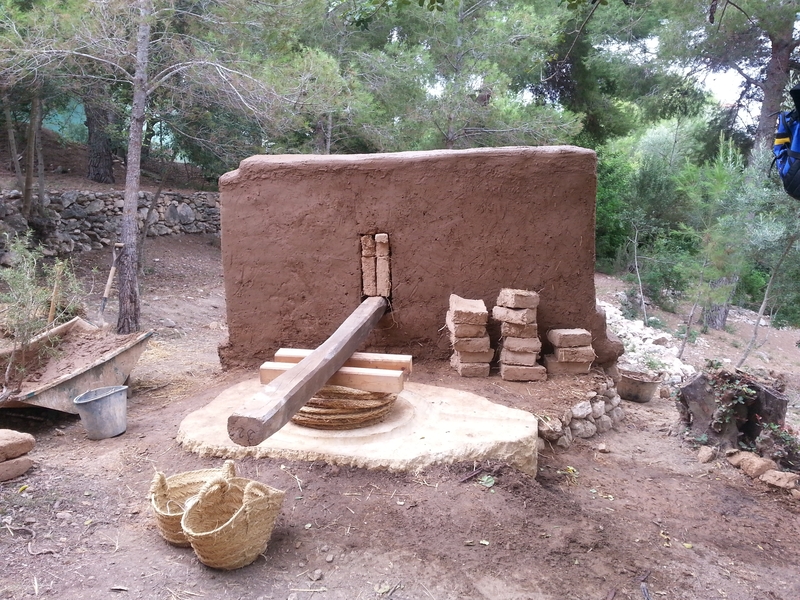 Els processos agricoles protohistòrics a la Catalunya Occidental, Monographies d'Arqueologie Meditéranéenne, 4, CNRS. ALONSO, N.(2000): Cultivos y producción agrícola en época ibérica. SAGUNTUM-PLAV. Extra-3. III Reunió sobre Economia en el Món Ibèric. Pàg. 25-46. ASENSIO, D. (1996): Les àmfores d’importació de la ciutadella ibèrica d’Alorda Park o les Toixoneres (Calafell, Baix Penedès, Tarragona). REVISTA D’ARQUEOLOGIA DE PONENT, 8. Pàg. 35-79. ASENSIO, D., MORER, J. i POU, J. (2003): La Ciutadella Ibèrica de les Toixoneres. Simposi Internacional d’Arqueologia del Baix Penedès. Territoris antics a la Mediterrània i a la Cossetània oriental. Generalitat de Catalunya, Barcelona. ASENSIO, D., MORER, J., RIGO, A., SANMARTÍ, J. (2001): Les formes d’organització social i econòmica a la cossetània ibèrica: noves dades sobre l’evolució i tipologia dels assentaments entre els segles VII-I A.C. Territòri polític i territòri rural durant l’edat del Ferro a la Mediterrània Occidental. Actes de la Taula Rodona celebrada a Ullastret. Monografies d’Ullastret 2. 253-271. ASENSIO, D., JORNET, R., LÓPEZ, D., MORER, J., POU, J. (2005): Una aportació sobre aspectes d’explotació agrícola en època ibèrica. El cas de la Cossetània i el camp de sitges del Turó de la Font de la Canya (Avinyonet del Penedès, Alt Penedès). Condicions de vida al món rural. Cinquenes jornades sobre Sistemes Agraris, Organització Social i Poder Local als Països Catalans. BELARTE, M.C., POU, J., SANMARTÍ, J., SANTACANA, J. (editors científics) (2001): Tècniques constructives d’època ibèrica i experimentació arquitectònica a la Mediterrània. Actes de la I Reunió Internacional d’Arqueologia de Calafell. Universitat de Barcelona. BUXÓ, R. (1997): Arqueología de las plantas, Ed. Crítica. BUXÓ, R., ALONSO, N., CANAL, D., ECHAVE C. I GONZÀLEZ, I. (1997): Archaeobotanical remains of hulled and naked cereal in the Iberian Peninsula: implication for the role of plant foods and ecological context. Vegetation History and Archaeobotany, 6, pp.15-23. BUXÓ, R. (1990): Metodología y Técnicas para la recuperación de restos vegetales (en especial referencia a semillas y frutos) en yacimientos arqueológicos. Cahier Noir nº5. CABRERA, P., SÁNCHEZ, C. (2000): El comerç grec amb el món ibèric durant l’època clàssica. Els grecs a Ibèria. Seguint les passes d’Hèracles. CANAL, D. I BUXÓ, R. (inèdit) AlordaPark(Calafell, Baix Penedès); Informe sobre les anàlisis paleocarpològiques. Camapanya de 1998. CUBERO, C. (1998): La agricultura durante la Edad del Hierro en Cataluña a partir del estudio de las semillas y los frutos, Monografies del SERP, 2, Barcelona. GÓMEZ BELLARD, C. I GUERIN, P. (1991): Testimonios de producción vinícola arcáica en L'Alt de Benimaquia (Denia). Coloquio "Grecia e Iberos, s.VI-IV a.C. Empúries. GÓMEZ BELLARD, C., GUÉRIN, P. (1993): Témoignage d’una produccion de vin dans l’Espagne préromaine. La production du vin et de l’huile en Méditerranée. Bulletin de correspondance hellénique. Supplément XXVI. École française d’Athènes. Paris. Pàg.379-395. JACQUAT, CH. (1988): Les plantes de l'âge du Bronze: catalogue de fruits et graines, Archéologie Neuchâteloise, 7. JORNET, R., LÓPEZ, D. i POU, J. (2003): Els orígens de la vitivinicultura a Catalunya. Producció i consum de vi en època ibèrica (segles VII-III aC). Actes del Congrés: Els paisatges de la vinya, Manresa. JORNET, R., LÓPEZ, D. i POU, J. (2004): Les evidències més antigues del conreu de la vinya i el consum de vi a Catalunya. Terra Alta. Denominació d’origen, núm. 4. Gandesa. JORNET, R., LÓPEZ, D. i POU, J. (2005): El naixement de la cultura del vi al Penedès. Dyonísos. Vilafranca del Penedès. MARINVAL, P. (1998) L'alimentation végétale en France, du mésolithique jusqu'à l'âge du Fer. Éditions du CNRS, Toulouse. MATA, C., PÉREZ JORDÀ, G., IBORRA, M.P., GRAU, E. (1997): El vino de Kelin. Consejo Regulador de la Denominacion de Origen Utiel-Requena. PÉREZ JORDÀ, G. (2000): La conservación y la transformacion de los productos agrícolas en el mundo ibérico. SAGUNTUM-PLAV. Extra-3. III Reunió sobre Economia en el Món Ibèric. Pàg. 47-68. POU, J., SANMARTÍ, J. i SANTACANA, J. (1995): La reconstrucció del poblat ibèric d'Alorda Park o de les Toixoneres (Calafell, Baix Penedès). Tribuna d'Arqueologia, 1993-94, Dept. de Cultura de la Generalitat de Catalunya. Barcelona, Pág. 51-62. RAMON, J. 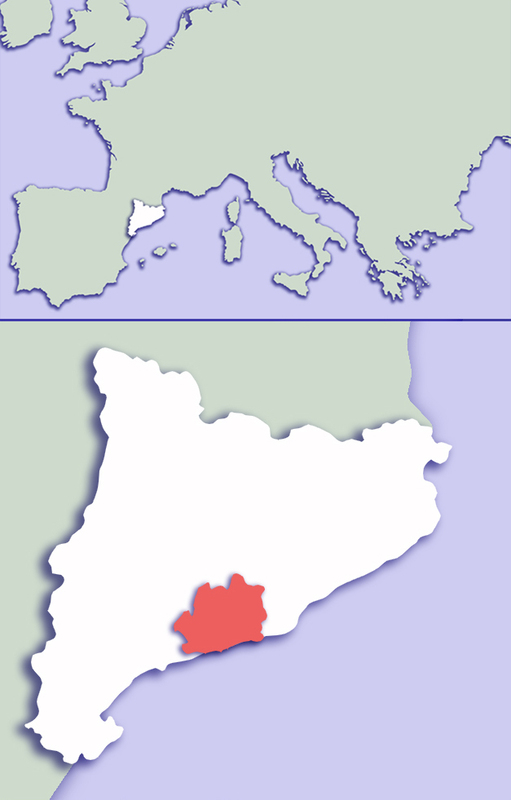 (1995): Las Ànforas fenicio-púnicas del Mediterráneo Central y Occidente. Barcelona, Universitat de Barcelona. SANMARTÍ, J. (2000): Les relacions comercials en el món ibèric. SAGUNTUM-PLAV. Extra-3. III Reunió sobre Economia en el Món Ibèric. Pàg. 307-328. VANDERMERSCH, Ch. (1993): Vins et amphores de Grande Grèce et de Sicilie IVe-IIIe s. Avant J.C. Naples: Centre Jean Bérard. VVAA. (1995): Arqueología del vino. Los orígenes del vino en occidente. Consejo regulador de las denominaciones de origen de Jerez y Manzanilla. Sanlucar de Barrameda. Jerez de la Frontera. Fig 2. Full grape carbonised.